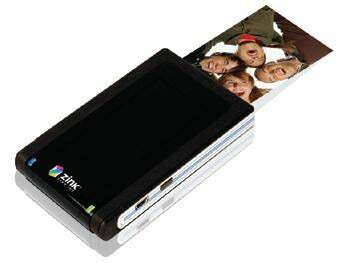 Zink Pocket Printer: iPhone Companion? Polaroid is not dead yet. Apparently it was only sleeping, but now its research labs have smelled the coffee and spun off Zink, a company whose first product will be a stand-alone printer that's about the size of a deck of cards. This one-button printer is designed to easily connect to a camera phone, and will cost less than a hundred bucks. Looks like a perfect companion to the iPhone, and might just work pretty well with D.A.V.E., that Seagate pocket drive with Bluetooth and Wi-Fi we mentioned earlier.